Introducing the Icy Dock EZ-FIT MB990SP-B Dual 2.5” to 3.5” SATA and IDE Solid State and Hard Disk Drive Converter. 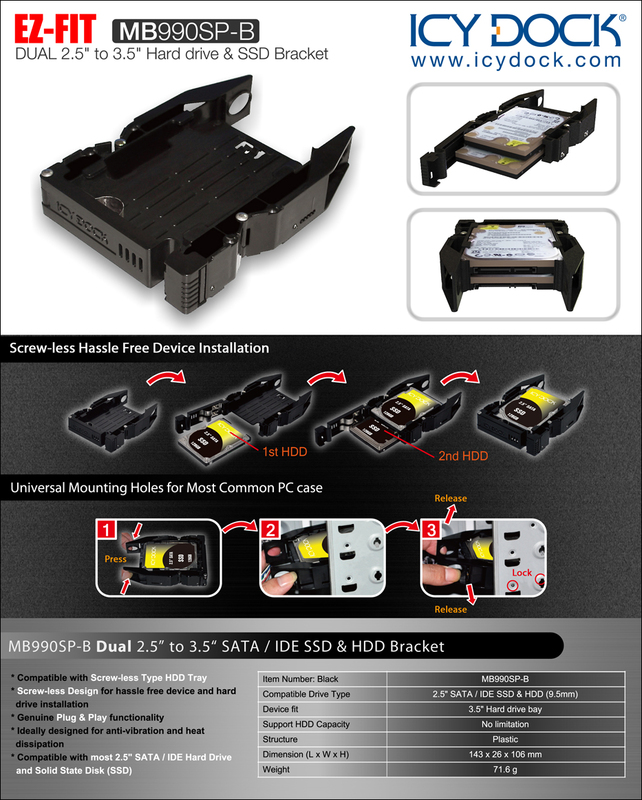 This dual bay drive bracket allows you to use two SATA or IDE SSD and HDD in an internal 3.5” drive bay in most standard cases. Since most cases are not set up to use 2.5” form factor, the MB990SP-B allows you to make a huge upgrade to your system with very little effort. The bracket will fit most types of cases. Out of the box it can be used in both tool-less and standard cases. The EZ Fit pins on the sides of the bracket fit into most standard mounting holes, and are also removable to use either your case’s proprietary mounting brackets, or to use screws for a more secure fit. The EZ FIT bracket is extremely lightweight and has an open air design for maximum air flow and cooling of the drives. Most standard 2.5” IDE or SATA drives can be used due to the open back design, allowing use of direct connections to the drive, also giving the user flexibility to mix and match drives.